I naturally arise early most mornings. Today, Saturday, I have some family obligations at 11 am. So, when I awoke at 3 am, I did the most rational thing that I could do. So, I headed to the Millers River. I targeted a stretch that is new to me and decided to nymph. The sun had just risen, the water looked inviting, and I was alone. There were quite a few birds chirping and the river was 58 °F. In other words, it was perfect. At that water temp., I’ve found that there are plenty of bugs in the water and the trout’s metabolism would be high. So, they feed. I fished a tailout of a run with an indicator. Nothing. 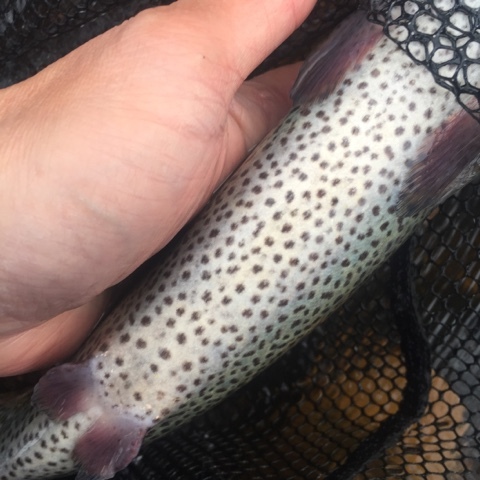 So, I moved up river and started to tightline-nymph the broken water. And, there were the fish, like clockwork. They were in quiet seams amidst fast-moving water that was 1′ to 5′ deep. The winning flies were variants I tie of the following: Frenchie, WD-40, and stone fly. Went 5-for-8 this morning over three hours, with three trout falling off barbless hooks when they went down river. 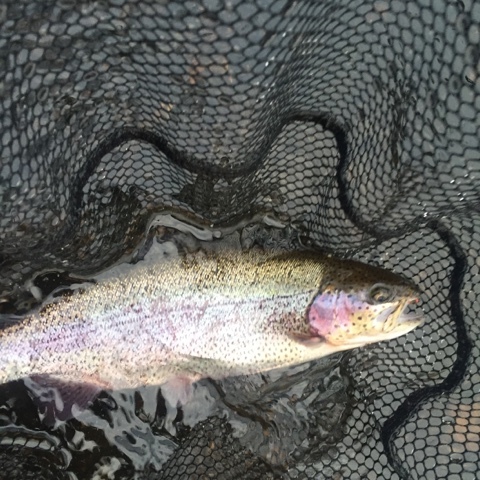 Nearly all the fish were good-sized and dark rainbows, like the one up top. 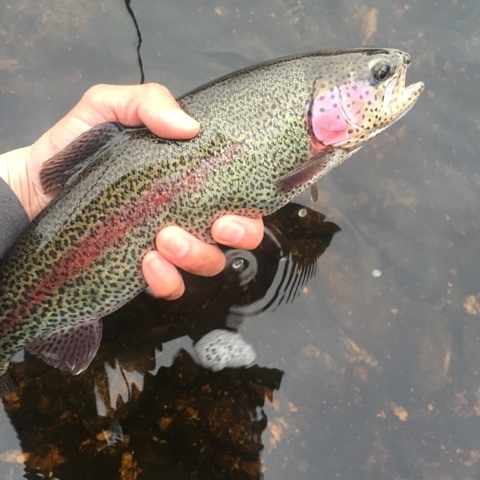 One rainbow had many spots. I mean, quite a few. A fun few hours on the water alone. Hi – does anyone happen to know if there is such a thing as an iPhone App that can be used to identify flies in your box? Kind of like the apps they have for wine that tell you all about the wine by just taking picture of it? I am completely "hooked" on fly fishing, and thank you for the comment! I am hooked as well. Not only fly fishing, but tying flies as well. I had a good day on the Swift below Route 9 with a #16 green rock worm I learned how to tie on Youtube. I had never tried that fly before, but it looked good and boy, did the trout love it. Impressive dedication… looking forward to getting back out on some MA rivers in a few weeks!